What if Elvis Presley had been an entertainer in the army? An Entertainer in the Army? For most of my 45 years as an Elvis Presley fan, I pretty much ignored his two-year army stint from 1958-1960. Since he didn’t perform in public or make any movies during that period, I really had no interest in what he was doing during that time, most of which he spent in Germany. He was “out of sight, out of mind” as far as I was concerned. However, a couple of years ago I read two books about Elvis’s army life: Private Presley by Andreas Schröer and Elvis the Soldier by Rex and Elisabeth Mansfield. Reading those two volumes gave me a greater respect for the importance of Elvis’s army experience. The Elvis who came out of the service in 1960 was quite different from the one who went in two years earlier. The changes he underwent, some good and some bad, had a profound effect on his personal and professional life during the 1960s. 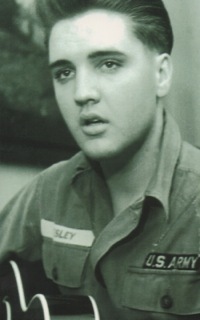 It is generally believed that Elvis willingly accepted his obligation to serve his country and that he wanted no favorable treatment if he were drafted. A closer look at his statements made at press conferences and to friends during 1956-57 reveal that he hoped to avoid the draft. (At an August 1956 press conference in St. Petersburg, Florida, Elvis said, “I’ll vote … for anyone who’ll stop the draft.”) When his draft notice finally came in December 1957, however, while disappointed, he nevertheless accepted it and went on to serve honorably. Another common misconception about Elvis’s military duty is that he worked in tanks. In fact, he was a jeep driver. In 1957, as Elvis’s chances of being drafted increased, questions arose about how the army would use Elvis. His stock answer was that, if drafted, he would accept any job the army assigned him. 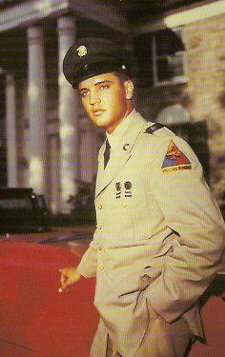 Behind the scenes, however, Colonel Parker worked to keep Elvis out of Special Services, the section to which drafted entertainers were usually assigned so that they could travel around and entertain military audiences. Parker concluded that it would be harmful to Presley’s post-army career if he were paraded around and forced to give essentially free concerts for two years. How the Colonel was able to convince the army to treat Elvis like any other common soldier is unknown. But once Elvis was inducted, the army could have assigned him to any work it wished. What if the brass had decided that Elvis would have best served the army in Special Services? They had to treat him like a celebrity anyway. In a November 5, 1958, Variety article headlined, “Elvis ‘Bigger Than the Generals Who Watch Over Him’,” a case was made for making Elvis an army entertainer. First, the article outlined the problems the army experienced in dealing with a celebrity the stature of Elvis. 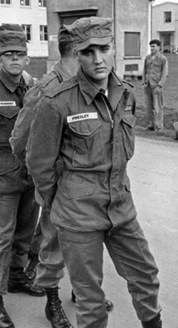 In October 1958, when Private Presley arrived in Germany, the army tried to keep his embarkation low key. Still, photographers dominated the scene and a hundred German teenage girls jammed the train platform to get a look at Elvis as his military train left the station. In November, about 150 members of the international press—newsreel cameramen, news service reps, German newspaper reporters—packed into an army press conference at the Enlisted Men’s Club at Elvis’s assigned base. The event caused a backup along the main roads to the base, as the credentials of every press representative had to be checked at the gate. While Elvis was in Germany, his superiors were under orders from the Pentagon to limit his access to the press. This caused the German press, who generally treated Elvis well, to heap criticism on the army for its policy of alternately putting Elvis on display and then hiding him away, and for keeping him out of its entertainment division, where many less talented draftees were assigned. Perhaps the best case for the army to use Elvis’s entertainment ability appeared at the time in The American Weekend, a commercial newspaper aimed at the American military in Europe. It outlined why and how Elvis’s army stint could have been quite different than it was. “The Army is apparently torn between a desire to keep Elvis locked out of sight and a half-concealed wish that he had enlisted in the Navy or Air Force in the first place. Everywhere Elvis has gone, the Army has been forced to make battle plans well in advance to keep the peace. Presley is far bigger than his company commander, bigger than the generals who watch over him, and the sooner the Army gives in to this truth, the sooner the furor will die down and everybody can get back to work. What would have changed had Elvis spent his two years in the army entertaining fellow troops and European crowds? First of all, thousands of his European fans would now have the memory of seeing Elvis perform, something they never got during the rest of his life. Second, Elvis’s act would certainly have had to evolve during those two years. His gyrating stage show of 1956-57 wouldn’t have played well to military audiences. I suspect the gradual transition into the musical mainstream that began when Elvis left the army in 1960 would have started early if he had been an entertainer in the army. 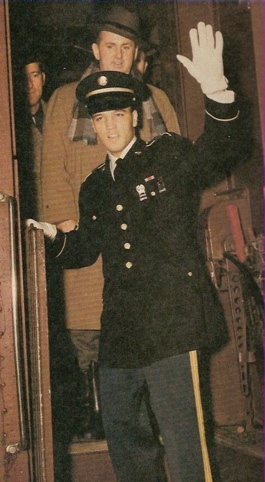 Third, as a military entertainer, Elvis would probably been allowed to record music during his army stint. "When the time comes to fight, Elvis will fight just as well as the soldier-typists, radio announcers, golf pros, club managers and sedan chauffeurs."